Start on October 20, 2019 at 9.30 a.m. The competition is a 25 k run. There is also the possibility that 2 runners share the distance by a relay. - Transfer is at 16 k, close to the refreshing point "Franzensträßle". You access "Franzensträßle" from the B464 road, on the right side wnen you drive towards Tübingen. Use the first turn off after the traffic lights of the "Weil im Schönbuch" access. Participants of the relay are asked to reach the transfer points by own means. 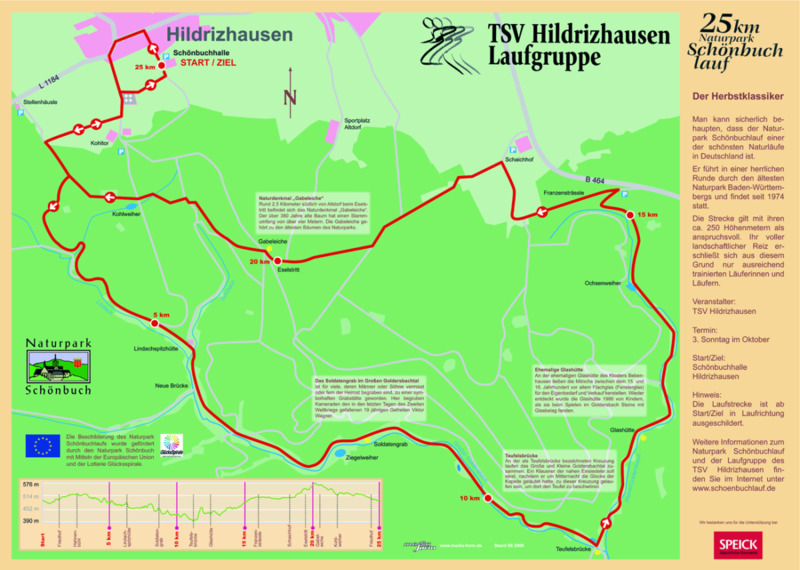 The start is at 9.30 a.m. in Hildrizhausen close to the "Schönbuchhalle" (runners returning later than 12.30 p.m. may not appear in the results). The starter packages can be obtained in the morning before the run or the day before. When: Saturday, 10/19/19 11.00 a.m. - 12.30 p.m. and Sunday 10/20/19 from 8.00 a.m.
Changing rooms and showers are in the Schönbuchhalle Hildrizhausen. The timing system is integrated in the bibnumber. Winners will be honored in the Schönbuchhalle . 25 k: Overall winner and the first 3 of each category obtain prizes (f/m). Relay: prizes for winners of the 3 categories (see above). Take the train S1 to Ehningen; there you will find a free shuttle service to Hildrizhausen at about 8.10 a.m, or you take the bus 752 at 8.38 a.m. for an 11 minute ride). There is also a connection from Böblingen (bus R72E, departure 7.38 a.m) via Holzgerlingen (arrival 8.09 a.m. in Hildrizhausen). After the race you may ask for the back connection. If you arrive in Hildrizhausen by VVS, € 2.00 of the railway fee will be refunded. At 8.45 a.m. there is a short Christian service on the school premises, organized by "Sportler ruft Sportler"
The organizers do not take over responsibility for any damage to properties or persons or for theft. Online registration it´s now open. on 10/20/19 (8.00 a.m - 9.00 a.m.). Registration for the relay is possible online only until 10/14/19 as long as the limit of participants has not been reached. There is no late registration afterwards! We do not offer a refund if a registered participant does not start for whatever reason. The 25 k roundtrack takes you on pleasant forest trails into the nature reserve "Schönbuch". Less than 20 % are paved. You are are gradually descending from 490 m (1630 ft) into the Great Goldersbach Valley until you reach a beautiful lake close to the "Teufelsbrücke" (Devil's bridge) turnoff at an altitude of 390 m (1300 ft). Then you have already accomplished 11 k. After that, the track gradually rises, and at "Franzensträßle" (the change point for the relay), the height of the start has nearly been reached again. Then there is an additional ascent of 60 m (200 ft) to the "Eseltritt" landmark at 20,5 k. But on the final descent, you will quickly reach the finish line.